Julie is a classically trained singer, performer, and voice coach who had a calling to create an exclusive program teaching voice to musically-gifted teens. She provides college-level instruction in a small group setting. 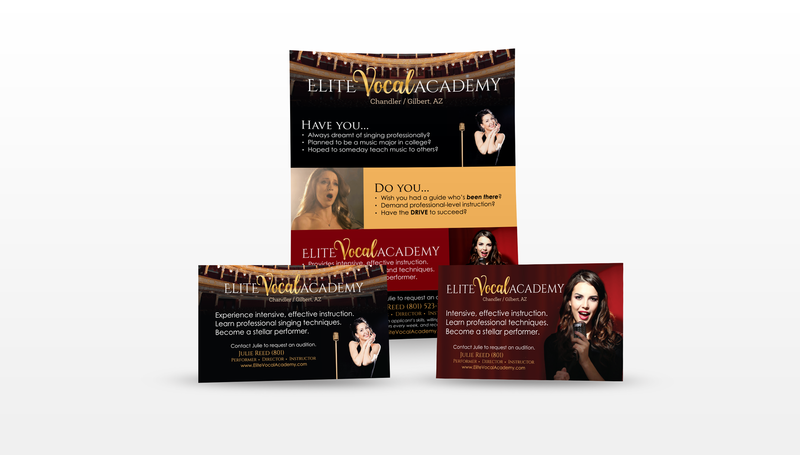 The front end of the site combines a classic operatic feel with a modern, youthful vibe to communicate what students can expect from this program. On the back end, we created a membership site for her private voice coaching students to have access to past lessons and to view their performances. To help promote her academy, Julie also needed printed materials for potential students to take home to their parents, so we created 1/2 page brochures and designed two different business cards for her to share when presenting at schools. Mobile is EVERYTHING these days, especially to teens! So we planned ahead for a great experience no matter what device her students used to access their courses. Once everything was perfect, we held a one-on-one screenshare training session to show Julie how to make changes to her site (including building and updating pages, editing the menu, uploading her videos to Amazon S3, etc.). We recorded the training so she can refer back to it whenever she likes – or share with an assistant!